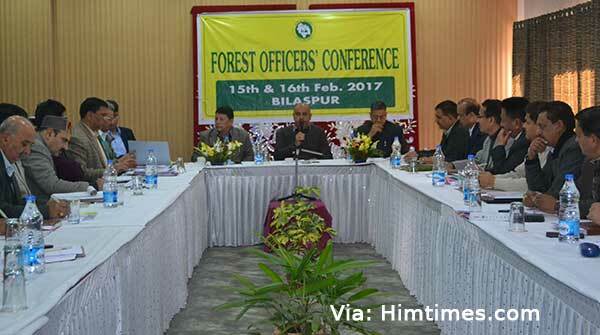 Two days forest Officers Conference was held at Bilaspur on 15th and 16th February 2017 in which officers of the Himachal Pradesh Forest department participated. Issues related to Forest nurseries, plantations, GIS and IT, introduction of tendering systems in forestry works, problems of lantana and pine needles were discussed during two days conference. Sh. Tarun Kapoor Pr Sec Forests told during the conference that Forest Department is one of the oldest department and holds maximum land in the state and therefore, expectations from the department is maximum. He told that besides routine works, the forest officers are required to do the innovative works by which community can be helped and employment to locals be generated. While informing to the media it was told that during two days conference strong emphasis was given to the forest nurseries. Species selection is important and tall plants are required to be raised in the nurseries, so that survival percentage of the plants in the field can be increased. As per Pr Secretary works done by the Forest department in Himachal not only affects the ecology of the state but also there in impact in whole of the northern India as most of the rivers originate from the state or water flows to the other states though the state. During the two days presentations were given by the officers, which include the presentations by Sh K.S. Thakur on the tall plantations and by Sh. Anil Vaidya on plantation norms. Sh V.R.R. Singh gave the presentation on the eradication of the lantana and its utilization besides the utilization of the pine needles. Sh S.D. Sharma Nodal Officer gave the presentations on FCA issues. Issues regarding shift from traditional plantations to the modern plantations were discussed. It was also discussed how the community or private participation can be increased in the forestry sector. During the conference it was also told that forest department is also working in the eco tourism activities and it is proposed that besides Eco Tourism sites, five parks near towns will also be developed. This will not only generate the employments to the locals but also educate the people regarding ecology and environment and recreational activities. Lantena and pine needles is a big problem in the forests of lower Himachal. Lantena eradication and use of pine needles were also discussed during the conference. How the private industries can be involved in the eradication works of the lantana, was also discussed in the meeting. Use of the pine needles was also discussed in the industries. It was decided that maximum use of the needles be done as fuel. Sh Tarun Kapoor told that such type of meeting/ conferences are required to be held regularly and decided that every three months there will be such face to face meetings and every month video conference will be held because this can help to know about the different problems faced at the field and policy related matters can be discussed with the field officers or the executing officers. Sh Anil Joshi Conservator of Forests, Bilaspur Circle thanked all the participants for participating in the conference. Sh Tarun Kapoor, Pr Secretary Forests Himachal Pradesh chaired the two days conference. Sh S.S. Negi Pr. Chief Conservator of Forests (HoFF), Sh S.K. Sharma Principal Chief Conservator of Forests (Wild Life) and Sh. Vineet Kumar Additional Pr Chief Conservator of Forests (Admin), Sh. V.R.R. Singh APCCF were also present during the two days conference besides other senior officers of the department. Chief Conservators, Conservators and one or two DFOs from all the Territorial and Wild life circles were present in the conference, besides the Senior Forest Officers from the headquarters.